From a quality-of-life perspective, orthotopic neobladder is arguably the ideal form of urinary diversion in the appropriate patient. Using either small bowel or sigmoid colon, the orthotopic neobladder is the method of choice for diverting the urine in men and women undergoing radical prostatectomy for muscle invasive transitional cell carcinoma. Increasing facility with the urethroneovesical anastomosis derives directly from experience with laparoscopic radical prostatectomy. The operation is technically demanding and sits on the cutting edge of laparoscopic reconstructive surgery. Kaouk and Gill et al. performed the initial experimental study of laparoscopic orthotopic neobladder in 12 pigs in 2001. They created an ileal neobladder with Studer limb extension, and the entire procedure was performed intracorporeally in all cases. Each of the anastomosis was created with freehand suturing techniques, and none strictured as assessed by both radiographic and postmortem study. Mean operative time was 5.4 hours, with minimal blood loss. Late complications included one port site abscess, and two cases of Escherichia coli pyelonephritis causing azotemia in two animals, one of which died at three months. Gill et al. published the initial two cases of completely intracorporeal laparo-scopic radical cystectomy and orthotopic Studer pouch in a 42-year-old woman and 57-year-old man, respectively. A five-port transperitoneal technique was employed for the cystectomy portion, and a sixth low midline port was added to complete the urinary diversion. Operative times were 8.5 (solitary kidney) and 10.5 hours, respectively, with blood loss from 200 to 400 mL. Specimen retrieval was performed through an extended umbilical port site incision in both cases. Oncologic specimens had pathologically negative margins, and both patients achieved complete daytime continence. The only other published case of complete intracorporeal orthotopic neobladder following laparoscopic radical cystectomy is from Beecken and colleagues, who performed the procedure with robotic assistance. In this 58-year-old man, a Hautmann ileal neobladder was created, and the entire procedure lasted 8.5 hours. The patient had good oncologic and functional outcomes at five months follow-up. The remainder of the literature consists of open-assisted approaches to the orthotopic neobladder. Preceded by cadaveric studies, Gaboardi et al. performed a laparoscopic radical cystectomy, pelvic lymphadenectomy, and ileal orthotopic neobladder (U-configuration), in a 72-year-old man for BCG refractory T-^ transitional cell carcinoma. After the cystectomy, specimen was extracted through a 5-cm supraumbilical incision, the ileal segment was isolated extracorporeally, and the neobladder was partially fashioned. They proceeded to perform the ureteroileal and urethroileal anastomoses laparoscopically. Operative time was less than the pure laparoscopic technique previously described, at 7.5 hours. Blood loss was 350 mL and the patient was discharged on postoperative day 7. Gaboardi et al. made several important observations about combining the advantages of minimally invasive laparoscopy with open surgery, not just with respect to time saved, the ease of bowel transillumination with exteriorization of the ileal segment, and the avoidance of peritoneal soilage during bowel detubularization. Although larger series will be required, the small laparotomy did not seem to negate the advantages of the laparoscopic portion of the procedure. A report by Abdel-Hakim et al. expanded published experience with a larger series of nine patients who underwent open-assisted laparoscopic orthotopic neobladder following radical cystectomy. Their ileal configuration was a Y-pouch (modified Camey II). The first three patients underwent open ileal exclusion and ileoileal anastomosis via an infraumbilical midline incision. The urethral and ureteral anastomoses were also performed through this incision. As operative times for the cystectomy portion shortened, the extracorporeally prepared Y-pouch was reintroduced for the following six patients, pneumoperitoneum re-established, and the anastomoses were completed laparoscop-ically. Mean operative time was 8.3 hours. In these patients, a right-sided 12-mm port extension was instead chosen for specimen extraction and neobladder creation. Similar conclusions have been made regarding the advantages of employing a mini-laparotomy for the reconstruction of the urinary diversion when the primary intracorporeal surgery is robot-assisted. Menon and colleagues reported 17 patients (14 men, 3 women) who underwent robot-assisted radical cystectomy, with urinary diversion performed through a mini-laparotomy incision. 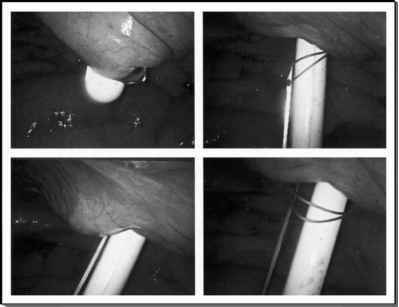 All but three (ileal conduit) had orthotopic neobladders including the W-pouch, double chimney, and T-pouch. Average operative time for the orthotopic neobladder portion of the procedure was 2.8 hours. The same group later reported robotic radical cystectomy in three more women, two of whom had orthotopic neobladders (W-pouch, T-pouch). The urinary diversion in these two took 190 and 170 minutes. In all 19 cases, isolation of the ileal segment, restoration of bowel continuity, detubularization, and pouch configuration was performed extracorporeally through a limited suprapubic incision. Finally, as a reminder of the innovative combinations possible amongst techniques, Guazzoni et al. performed an open-assisted orthotopic W-shaped neobladder in three patients. Following laparoscopic cystectomy, bowel exclusion, restoration of bowel continuity, pouch construction, and ureteroileal anastomoses were performed open through a 7-cm periumbilical incision. For the remainder of the procedure, including urethroneovesical anastomosis, this incision was converted to a hand port. Mean operative time was 7.4 hours. Although the choice of a particular neobladder configuration assumes less importance for an open-assistance technique, the particular choice of ileal pouch assumes greater importance when the reconstruction occurs purely laparoscopically. The Studer neobladder is a practical choice in this regard. This remains an assumption, as Gill et al. and Beecken have reported the only cases of purely laparoscopic orthotopic neobladder (Studer pouch and Hautmann neobladder, respectively).